The Travel Specialists had a big year celebrating 50 years as a company. As we wrap up 2017, Managing Director, Richard Ruskin shares his thoughts and feelings about the years celebrations and what it feels like to head up one of the longest established and reputable travel companies in Australia…. As the MD and “parent” to one the longest established and reputable travel companies in Australia, how are you feeling? Feeling very good. It was an exciting year. This year we achieved a much wider reach and considerably greater exposure. Within the industry we were described as “the quiet achievers”. The Gold Collection launched to celebrate our 50th anniversary was very successful as was the emergence of The Travel Specialists brand as an umbrella to the specialist destination sub brands. What was the highlight of this 50th year for you? The fact that we made it!! There was so much excitement this year with having achieved 50 years in business. There are only two other travel organisations who have exceeded 50 years, both starting as bus companies, transitioning into travel companies. We are proud to be a legitimate travel company in its own right for the entire 50 years! Why do you think the company has been such a success? A big part of why the company has been such a success is because of the staff. They are the most important part of the company. Our team love what they do, they are passionate about their specialist destinations and enjoy taking ownership of their role within the company. It’s a “win win” for me as a boss and an owner. It was wonderful to celebrate our 50th anniversary and to see the team so proud to be part of such a long established business. You have been owner and MD now for 21 years, what has been the biggest challenge over this time? There are many challenges within the industry but the most predominant one in recent times has been online operators and dishonesty. Promoting luxury travel packages using 3 star hotels is just the beginning….. We take pride in delivering honest product options for clients so the dishonesty and false advertising can heavily impact a destinations reputation. It then becomes challenging for genuine operators to overcome these inaccurate perceptions. How have you resolved or worked alongside it? We’ve worked alongside this challenge by spending extra time with agents and clients making them aware of what they get when they book through us compared to what they get booking online or via generic operators. Our Specialists are the best of the best, they have an unparalleled wealth of knowledge and experience in their product destination. 2017 saw us begin the process of educating our prospective clients. 2018 will see us continue to actively promote our point of difference. What has been your most rewarding experience in the business to date? Seeing staff develop is always very rewarding. Our GM, Savio is a prime example of the development path staff can take. 13 years ago Savio started in a part-time capacity providing admin support, his next position was a Junior Consultant then into a Senior Consultant role, Reservations Manager and now General Manager. Supporting staff through challenges in their role, training them to grow their skills base and assist with their professional development is hands down the most rewarding aspect of being in business. What are the top 3 things you learned about business during your time with the company? Staff – There are many businesses who don’t value their team members and is evident by their high staff turnover. I have staff that have been with us for 23 years. Half the team have been with us for over 7 years. I place immense value on that. Reputation – We have an excellent reputation in the industry for being honest, fair, looking after our clients, looking after our agents. We deliver what we say we’ll deliver. We take feedback seriously and along with our carefully selected destination partners, we are committed to excellence and continuous improvement. Authenticity – We believe in ourselves and in what we are doing. We know our point of difference and appreciate the value we bring to the industry. We have a clear direction and a committed team. With the gift of hindsight. What advice would you give your 25 year old self before taking on this business? One of things I would have said to myself is to “have a go, you’ve got this”. With a Prussian father, I had a conservative upbringing and was encouraged to be very cautious in my endeavours. Whilst it has served me well in many ways, I feel that if I threw a little more caution to the wind perhaps the business would have grown bigger, sooner. What is it that you love so much about the Travel Industry? This industry is different every day. Our destinations are different every time you go there. There are always new and exciting things happening. What inspires me in life is not climbing the mountain, but seeing what is on the other side of the mountain. I feel exceptionally lucky to be involved in Africa as much as I have been. 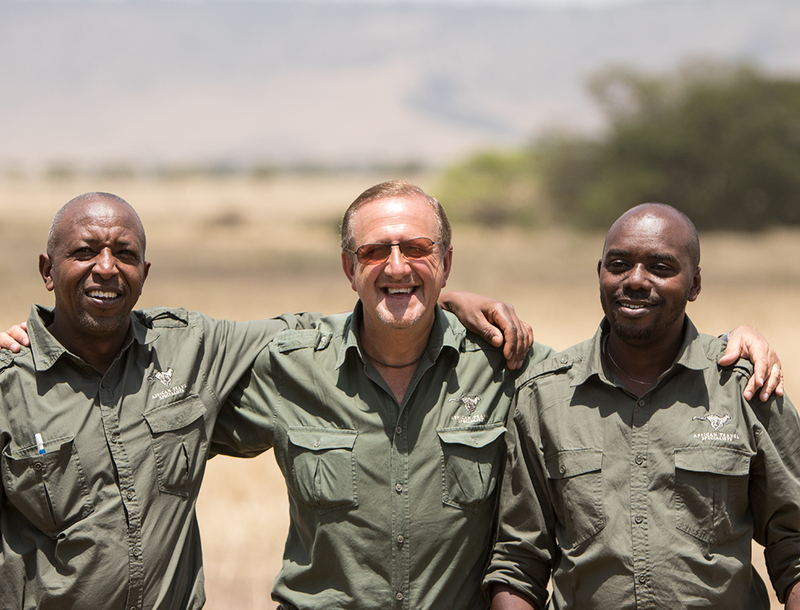 As a pioneer of the African Safari; not a day goes by where I am not grateful for my incredible journey, the people I have met along the way and for the opportunity I have to inspire and share our incredible destinations with others. What’s next for The Travel Specialists group? In 2018 our main objective is to educate our wider travel community. We want people to know that if they are not on a Travel Specialists itinerary then they are simply not getting the best possible experience in that destination. We have the people, the networks, the knowledge, experience and commitment to delivering a premium travel experience. Beyond next year?..… well the world is a very big place! I am often contemplating the many possible directions The Travel Specialists can go with this talented team. There is one thing I can promise you and that is, it won’t be boring!